The Torin now comes in two flavors with Altra calling out the Knit for "Comfort" and the Mesh for "Speed". The Torin is a well cushioned, 28 mm heel/ 28 mm forefoot Zero Drop daily trainer. The overall specs don't change from the 3.0 although we note some subtle and welcome changes in ride in both and in cushion in the Mesh. What is new are very comfortable new uppers with an engineered mesh upper in the Mesh and an engineered knit upper in the Knit. The Knit weighs approximately 0.4 oz more than the Mesh with the Mesh 0.6 oz more than the Torin 3.0 but both still come in below 10 oz. so a lot of shoe for the weight. To hold the foot on these pliable uppers with no overlays with minimal heel counters, higher ankle collars along with two new internal A straps are incorporated at mid foot on both sides. Please read on for the details and for how they run. Bold and attractive each in their own way both versions really call out Altra signature Foot Shape toe box. And quite a toe box it is. Roomy in width with just the right amount of height and stretch to keep from swimming around but no longer with the low front dive, medial toe overlay and stiff bumper of the 3.0 which had some sizing up a half size. I did not size up in the 3.0 but did notice that low front and for sure would not size up in the 3.5 as I fit me perfectly true to size. 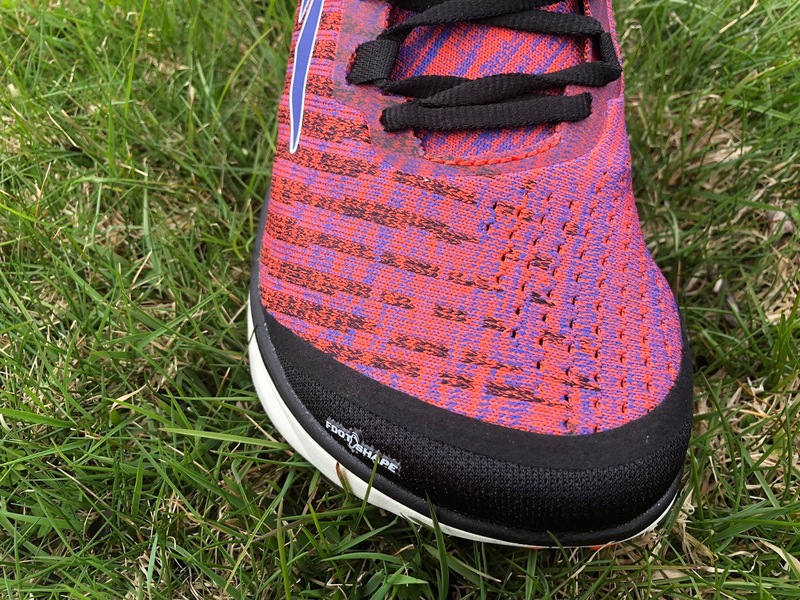 Altra calls out the Knit as the comfort version and the Mesh as the speed version. At least at the upper level, but read on, this is spot on accurate. The 3.0 had a dense conventional mesh upper with melted in dot overlays for support. The Knit's stretchier knit allows the toes to easy push up without the foot sliding around while the heel hold with no heel counter is fine if a bit relaxed for my tastes. The knit is dense so this will be a warmer shoe than the more open engineered mesh...Mesh. The mid foot hold is also somewhat more relaxed in the Knit than the Mesh. The Mesh's upper is more breathable and less stretchy but is pliable, soft and very comfortable. At the toe box, the Mesh's large ventilation holes provide some give for the toes but in combination with a slightly stiffer toe bumper, which is maybe also a touch broader over the toes, we did not quite have the sumptuous comfort of the Knit but did have a better hold up front. The mid foot of both of these pliable uppers is securely held by two "A" straps on each side, in both models. The forward one opens into an A further down towards the midsole than the rear one. The laces run through each A strap. They remind me of Saucony's Pro Lock in the Kinvara but here are totally unobtrusive, unlike the ProLock which is distinctly felt. I think such straps are essential with these newer very light and pliable engineered mesh or knit uppers without overlays. If the engineered mesh is stiffer such as in newer Hokas then they are not needed but fit for different foot volumes can be trickier without them in stiffer mesh. A strap down the middle of the Mesh's tongue holds the laces in place with three loops and in combination with the A straps and pliable upper gave me a quick, easy, and secure fit. Further back the Knit tongue is more of the upper's knit. It is dense, soft, and has some body/structure to wrap and stay over the foot and keep from twisting. Both models have a partial bootie construction. Towards the front of the tongue we have an approximately 1" wide stretch strip on the lateral side with a broader bootie on the medial side. The 3.0 had no bootie. The Mesh has a padded softer tongue and a more substantial bootie as it also extends further back on the lateral side. I am not sure why the Knit does not have the more substantial bootie on both sides as it might have helped improve mid foot hold somewhat. Both shoes have an impeccable, easy pressure free lace up and secure foot hold, although I prefer the slightly more secure mid foot hold of the Mesh. The ankle collar is similarly padded with a touch more hold in the Mesh. The Mesh's outer heel material is suede like while the Knit's is a dense thin textured plastic overlay. Both ankle collars are considerably higher than the very low one in the 3.0 and the slightly higher one in the 2.5. The 3.0 had a stiff plastic heel cup. Vertically at the heel and low along the sides the Mesh has a low pliable internal stiffener while the Knit has none at the heel and an equally pliable external stiffener on the sides. The result is that the Mesh has a somewhat more secure heel hold echoing the somewhat more secure hold of the forefoot. I did worry that the white/gray suede like rear heel fabric will quickly pick up dirt and it has. The 3.0 and 2.5 relied on a series of variable density melted in dots for the upper's support and which were very effective if making the uppers trail shoe support worthy. 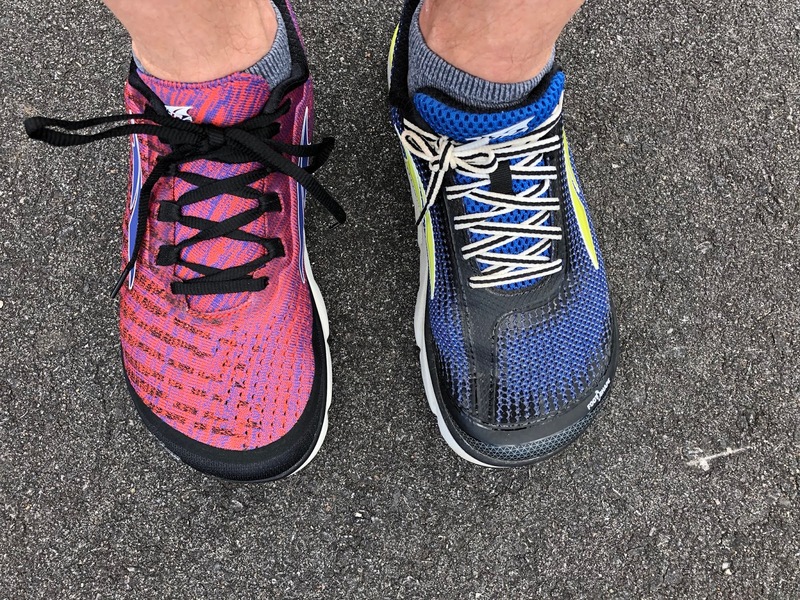 Compared to the Torin 3.0, and especially the 2.5 , and I ran a lot of smoother trail miles in the 2.5 with total security, the new 3.5 due to the light pliable mesh and knit likely won't quite be the trail hybrids the earlier models were but I need to test more on trails. That's OK. After all these are road shoes. While subtle, and after noticing that the Speed actually has a somewhat softer and more cushioned feel than the Knit, my friend Harold Shaw, a truly sharp shoe geek immediately noted the same running one on each foot and pronounced he felt a difference in the sock liners. Comparing we indeed discovered the Mesh has a thicker denser sock liner which interestingly is also very close to the same weight as the Knit's. The Knit appears to have the same thinner sock liner as the 3.0 It also rides somewhat firmer than the Mesh and about the same as the Knit when compared one on each foot. More in Ride but the "comfort" Knit, while definitely having a very comfortable more relaxed upper is also firmer under foot than the Mesh. We think not putting the Mesh sock liner in both was a misstep. The midsole has a 28mm heel and since this is a zero drop shoe also a 28mm forefoot stack. No changes were highlighted by Altra from the prior version. The midsole is made up of a two layer combination of Abound as a bouncier layer under foot and below that Altra's EVA. As in most Altra, the forefoot is notably well cushioned due to the high stack there. Many conventional trainers have 8-10 mm less forefoot stack and cushion while having similar heel heights. Unseen below the footbed is Altra's InnerFlex a system of tennis string like grooves in the midsole to increase flexibility and lighten. Flex is excellent for such a high forefoot stack. 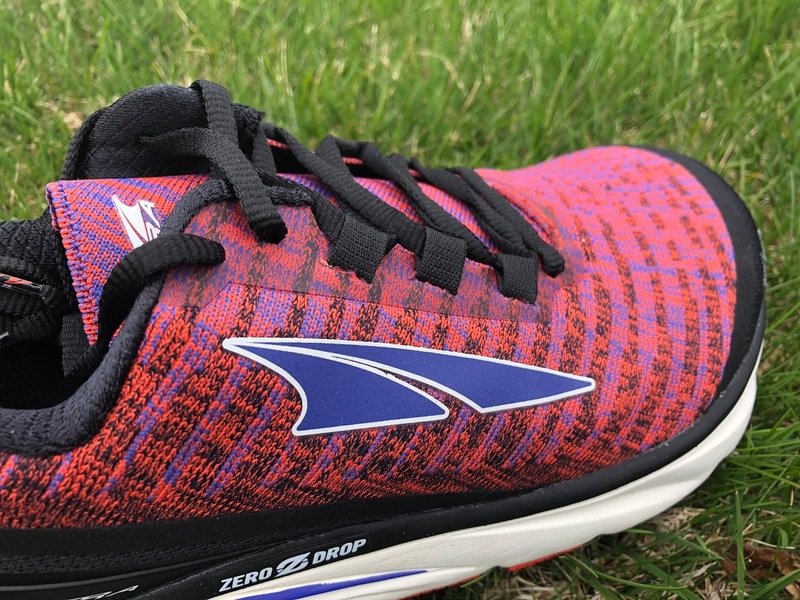 The outsole features Altra's FootPod technology where the geometry mirrors foot structure and motion. In the picture above the orange areas are the firm durable rubber, the white areas are exposed midsole. The coverage is considerable. I note so early scuffing of the lateral exposed midsole areas on the lateral (right) front, not illustrated in this picture of the as new outsole. The outsole appears in all respects identical to the 3.0's. If you are an Altra fan and Torin fan the ride will feel familiar, very familiar. This said we noticed both versions of the 3.5 were very slightly softer, less slappy, and transitioned more smoothly than the 3.0. The Torin 3.5 is decently light, lively and fast for its relatively high stack and has good response. As a zero zrop shoe the "missing heel" is noticed somewhat more than the lower 26 mm stack somewhat firmer Altra Duo but not overwhelmingly so. The Torin 3.5 updates the upper of its predecessor, for the better. 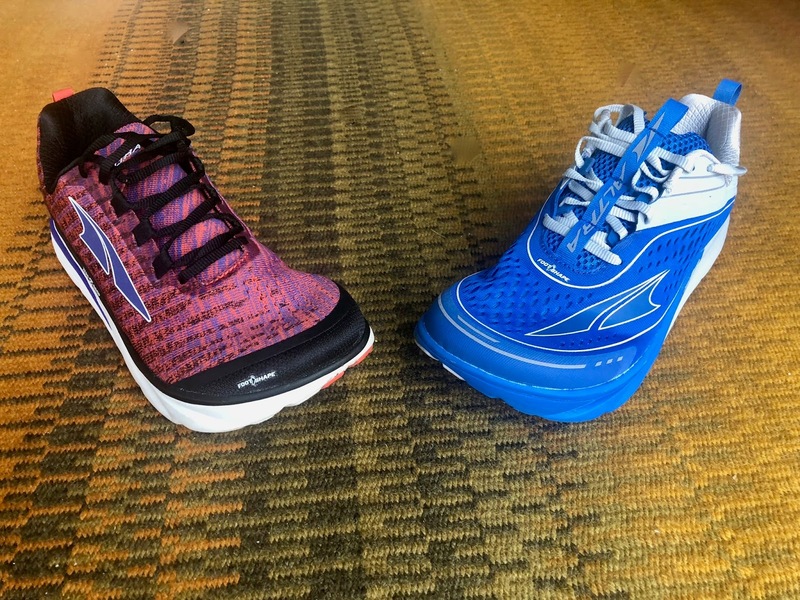 Altra now offers a choice of Mesh for speed or Knit for comfort in the Torin, its flagship neutral daily trainer. Both versions, in comparison to the Torin 3.0 and especially so for the Mesh, are a touch softer, less slappy, and transition slightly more smoothly. The Knit version is slightly more relaxed with more front toe overhead height as it stretches but not does not have quite the mid foot and heel hold of the Mesh. It would be a better choice for high volume wider feet, while the Mesh might work better for narrower lower volume feet. Interestingly, on the run, the Knit is actually slightly firmer we think due to its thinner, less dense sock liner. We are puzzled as to why the comfort Knit didn't get the plusher sock liner of the Mesh which we thought led to a slightly softer road feel of the Mesh, reducing some of the harshness felt in the Knit and the 3.0. 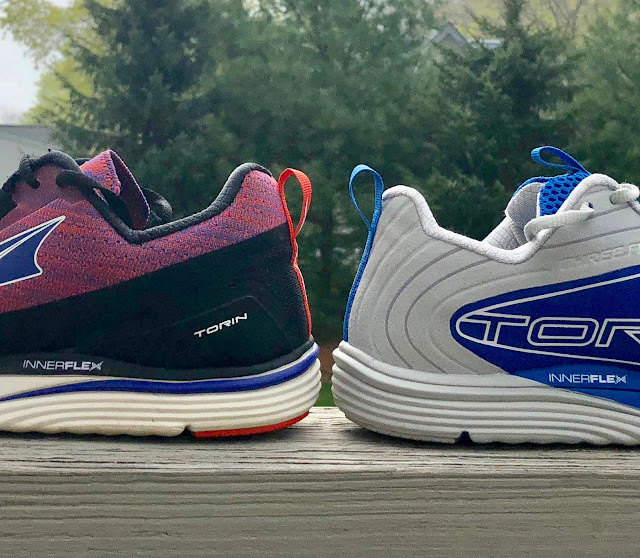 The Torin 3.5 is a great first zero drop shoe as it has that high 28mm stack front and back with a middle of the road cushioning feel. Very soft or very firm low or no drop shoes can be more tiring on the calves and achilles and longer to adapt to. We alway advise caution and a gradual build up in starting with low or no drop shoes if your usual running shoes have 6mm or more drop. -0.05 for weight gain of 0.6 oz over the 3.0. It is unclear how such as seemingly lighter upper with no heel cup led to weight gain as the midsole and outsole are identical to the 3.0. Is it the weight of the A straps and higher ankle collar? -0.05 for less balanced feel than Altra such as the Duo. The zero drop is more noticeable in Torin. -0.05 for weight gain of 1 oz over 3.0. Knit does tend to weigh more than mesh. -0.05 for less balanced feel than Altra such as the Duo. -0.05 for slightly less cushion, more shock than Mesh. Due to the sock liner? Both new Torin have more supportive uppers than the Duo. The Duo's very minimal upper has greater toe box height and volume but not the locked down fit of the Torin. 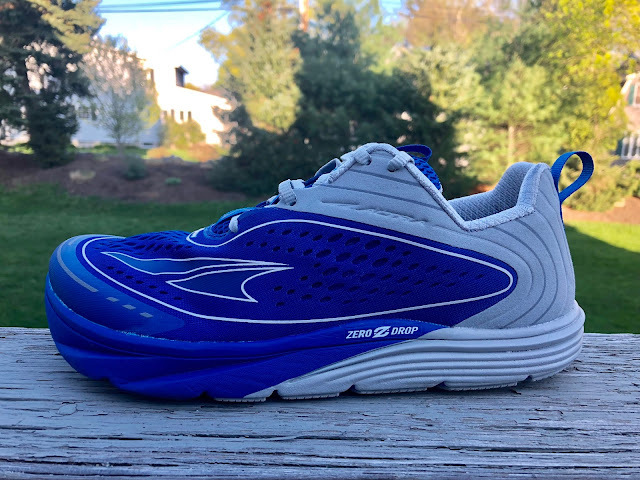 Lower volume feet or those seeking more support should fit better in the Torin..On the run ,the lighter 8.5 oz, slightly lower stack Duo is somewhat firmer but conveys less shock and seems more balanced between forefoot and heel at zero drop so less sensation of missing the heel. I found Duo segmented outsole more effective in transition and toe off. A tough call but I'll live with the Duo's minimal upper for its superior ride. The Instinct weighs over an ounce more, has a yet roomier upper vertically upfront with zero overlays or stiffer there beyond some cosmetic overlays. It is a touch narrower too but all the soft mesh stretches like a glove. 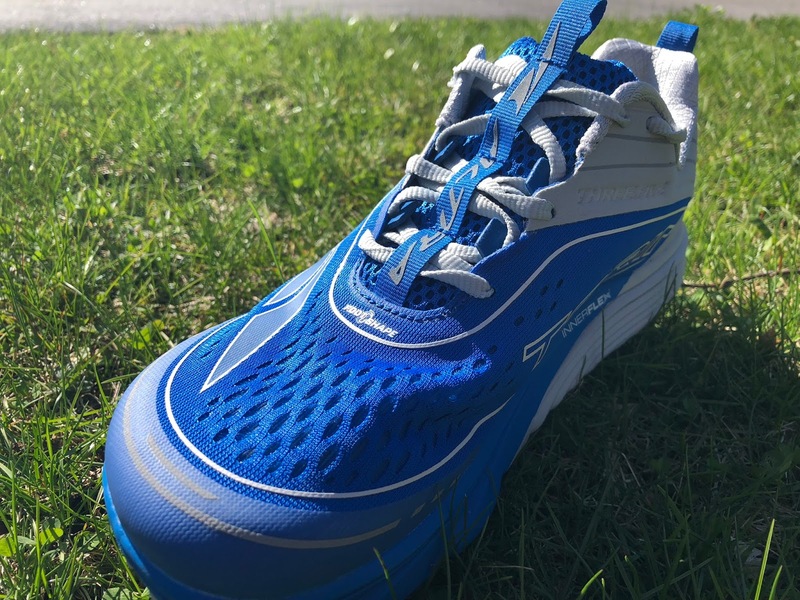 Surprisingly it is more lively and responsive than the Torin but its weight holds it back somewhat from being any kind of a faster shoe as the Torin is. It has a 25mm front and back stack with a very thick yoga mat type insole, designed to be removed to accommodate orthotics if need be. The foot landing is somewhat softer than the Mesh's and for sure the Knit's and then after landing there is a nice rebound from the firmer lower height midsole without excessive shock. Because of the weight I would still lean towards the Torin 3.5 but not by much. Sam Winebaum is the Editor and Founder of RoadTrailRun. He has been running trails and roads and run shoe and tech geeking for 45 years. As he turned 60 in 2017 he was thrilled to clock a 1:35.24 half as well as 2 days after his 61st birthday a 3:40 marathon. He runs his roads and trails in coastal New Hampshire and Park City, UT. The Torin 3.5 were provided at no cost. The opinions herein are entirely the authors'. Sam thank you for the mention and it was a lot of fun attempting to figure out the differences between the two models. 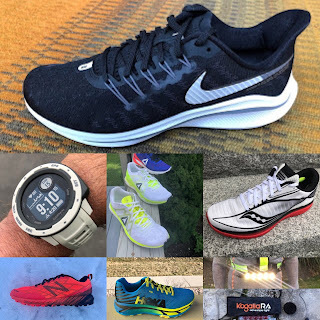 I really like both models with a slight preference for the Mesh model and if I was going to run in a zero drop shoe one of these would be the model I would choose. They both felt comfortable on the feet and when I picked up the pace the shoes didn’t get in the way of how I run. Great review of the Torin’s. I did run in the original Torin’s way back when and running in these reminded me of how well I did run in them. Was a bit confused. Mesh and knit versions but comments also on "speed" version. Which version is that? Sorry for any confusion. See the Introduction and the Conclusions. 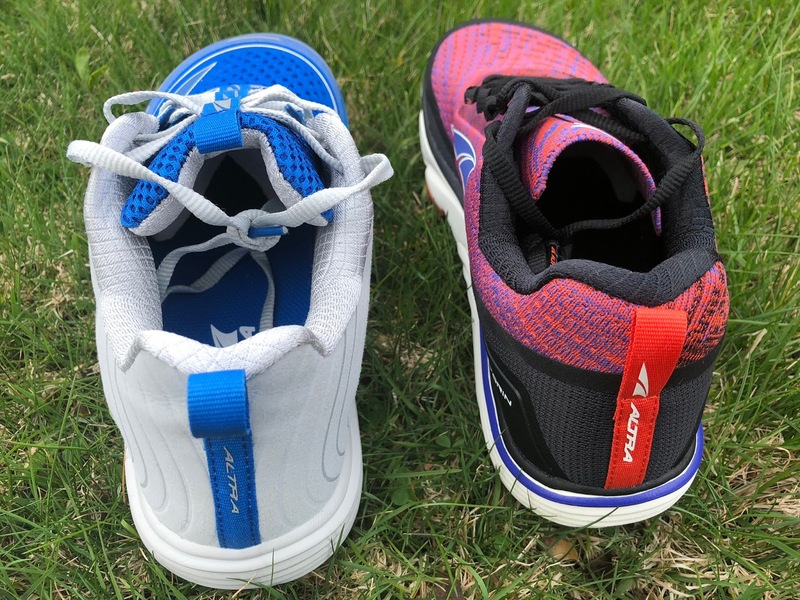 Altra calls out the Mesh for speed and the Knit for comfort. In terms of actual fit and performance of the uppers. I would agree with their designations. As detailed in the review the Knit is actually slightly firmer due we think to its thinner less dense sock liner. Firmer does not always mean faster. We prefer the Mesh's sock liner as it adds a bit of cushion and rebound with a touch less road feel harshness. How does the mesh compare to the Torin 2.0 (if you have familiarity with the older version)? The Torin 2.5 and 3.0 seemed to be stiffer and not as comfortable upper when I compared them to the 2.0. Hoping that these new ones are much like the 2.0s. Unfortunately we did not run in the 2.0 but I do agree 2.5 and 3.0 had stiff uppers, as much the mesh as the dense pattern of printed dots. This made them very trail worthy shoes as said in the review. Both the 3.5 Mesh and 3.5 Knit are far more comfortable than 2.5 and 3.0 with the Knit the most comfortable but not quite as dialed in and supportive as the Mesh. Sam, Thanks for your great reviews! I'm a huge fan. Could you possibly give a brief comparison of both shoes to the Escalante? Is the upper on the knit torin similar? I know briefly discussed above but how does the mesh fit a higher volume foot? I've been running in the escalante since it came out and love it except for a few reasons....need something with more lock down but still accommodating to wide foot and need slightly just slightly more cush. I love the ego midsole! Also any other shoes you would recommend for a wide foot that is a solid workhorse shoe that can go fast (100-800m), take a beating, and go long (half distance type). I tried a lot of shoes out but cant find the one. I love the Brooks ghost and Wave Rider but mm drop to significant. Iso fit upper for Saucony is insecure and NB fresh foam kills my legs. Thanks in advance. Thanks for reading and commenting. Plenty of lockdown and a touch more cushion but not as dynamic in the Torin 3.5. Given your wide foot you might be happier in the Knit version but it will have a touch less support than Mesh. Take a look at our just posted Escalante 1.5 review: http://www.roadtrailrun.com/2018/05/altra-running-escalante-15-review.html No changes underfoot but an improved lockdown. I might look to the Duo and Instinct compared in the review with instinct having a more stable supportive upper than Duo. Instinct is a great and lively workhouse despite its weight. 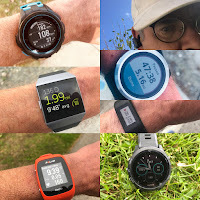 You might also look at the Paradigm 4 initial review here: http://www.roadtrailrun.com/2018/04/altra-running-paradigm-40-first-look.html. It is a lot more shoe compared to Escalante so not great for that sprint work. but does have the EGO midsole. You might also consider the Topo Ultrafly http://www.roadtrailrun.com/2016/05/review-topo-athletic-ultrafly-natural.html. Great foot hold, plenty of cushion and an anatomical toe box. Very much looking forward to trying the Mesh as well as the Paradigm. Looking forward to the full review of that, Sam. Im looking at upgrading from the Torin 2.5 to 3.5 Mesh. Do you know how sizing compares between those models?